The direct probe has always been a popular means of introducing samples into a mass spectrometer. The technique is fast and requires little or no sample preparation. Applications of the direct probe technique include drug and pharmaceutical sample screening, quality control sample analysis, spot analysis of chemical reaction mixtures for synthesis rate monitoring, and analysis of compounds that cannot be chromatographed. However, the technique has never been reproducible or quantitative, chiefly due to the manual loading of sample onto the probe. This study describes the application of a new automated direct exposure MS probe (AutoProbe™), which overcomes the limitations of manual probe techniques.> The AutoProbe can perform an entire MS sample analysis reproducibly, quantitatively, and unattended in under 3.0 minutes. In a typical sample analysis, the AutoProbe precisely places the sample on the direct expose probe (DEP) wire, reproducibly introduces the sample into the mass spectrometer, and reproducibly heats the wire according to a current program so that the sample may be analyzed by the MS. Variability in sample handling and analysis are greatly minimized, resulting in reproducible and quantitative analysis of samples with both EI scanning and SIM mass spectrometer techniques. The Direct Exposure Probe (DEP) tip uses a platinum wire coil for the analysis of samples. 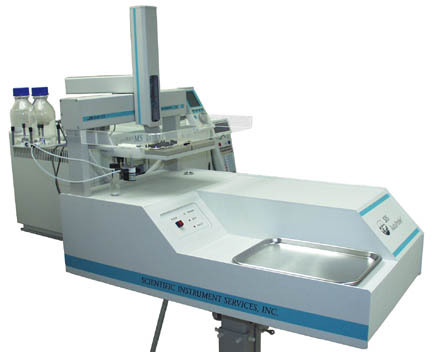 Samples for analysis are dissolved in a suitable solvent and placed into the Autosampler tray by the user. The Autosampler then injects 0.125 to 1.0 ul of the prepared sample solution onto a small platinum wire loop on the tip of the probe. The AutoProbe is designed to interoperate with the ThermoQuest Xcalibur MS Software and the Finnigan Trace MS.> The AutoProbe is fully integrated with the Xcalibur software operation, including system configuration, methods setup, sequences, sample runs, and data storage, resulting in a seamless probe-mass spectrometer operation package.> In addition the technique has proven to be easily used in an Open Access environment. The standard sequence of operation of the AutoProbe System is as follows. The AutoProbe sample analysis parameters are entered into the AutoProbe method screen in the Xcalibur software. The Trace MS and CTC Autosampler parameters are also entered into the appropriate method screen. The method is saved under a given name. The sample information for each of the samples is entered into the sequence setup screen in the Xcalibur software, and the sample analysis method is started. The AutoProbe probe tip moves into the sample load position, with the DEP filament wire directly under the syringe injector position. The CTC Autosampler injects 0.125 ul of the sample in solvent onto the DEP filament wire. The AutoProbe tip moves into the isolation valve of the AutoProbe, the isolation valve is evacuated and the AutoProbe tip moves into the MS vacuum to within 2" of the MS source. The DEP probe tip is heated in vacuum at a DEP filament current of 20 mA for 15 seconds to remove the solvent from the sample. The AutoProbe moves in position against the MS source, the MS starts scanning and the AutoProbe temperature ramp is started to desorb the sample into the MS source. The typical filament current program involves a 900 mA ballistic heating of the DEP coil for 30 seconds. The MS stops scanning and collecting data once the filament ramps are complete. The probe moves about 1" away from the MS source and a filament bakeout is started to clean the DEP wire and prepare it for the next sample. The bakeout program is typically consists of 1000 mA for 15 seconds. The probe is removed from the vacuum system and readied for the next sample. A series of organic compounds with molecular weights ranging from 200 to 400 amu were each dissolved in a solvent (either methanol or chloroform), and successive dilutions were made from 500 ng/ul down to less than 1.0 ng/ul . About 25 different concentrations of each of the compounds were prepared. The following is a typical set of standards prepared:> 500, 450, 400, 350, 300, 250, 200, 180, 160, 140, 120, 100, 80, 60, 40, 20, 16, 12, 8.0, 4.0, 2.0, 1.0, 0.5, 0.2, 0.1 (nanograms per microliter).> About 500 ul aliquots of each of the dilution were placed in individual 1.8 ml sample vials, which were then placed into the sampling tray on the AutoProbe's CTC Autosampler. Each sample was analyzed in triplicate for each method, and in a few cases a sample was analyzed five sequential times to determine the reproducibility of the analysis. In addition a blank methanol sample was analyzed between each different concentration. Historically the direct probe techniques have not been known to be reproducible. It is quite difficult to accurately and reproducibility apply a sample to a DEP probe tip. In addition the DEP probe tip wire is often touched, the coils distorted or the coils shorted out when samples are injected onto the DEP filament wire. Changing the geometry of the DEP filament coil changes its heating patterns and therefore minimizes the chance for reproducibility.> The AutoProbe eliminates these problems. "Memory Effects" - To test "memory effects" with the DEP technique, cholestane samples were prepared in chloroform at a concentration of 500 ng/ul. An injection of 0.5 ul of this sample (total 250 ng of cholestane) was injected onto the DEP probe tip and analyzed as described previously.> This analysis was completed five consecutive times within a 15 minute time span (3.0 minutes per sample). After each sample run, the DEP wire was baked out at 1000 mA for 15 seconds.> After the fifth cholestane sample was analyzed, 0.5 ul of methanol was injected onto the DEP probe tip and analyzed.> Both plots shown below are at the same intensity scale (Figure 5). >The cholestane sample produced a strong total ion chromatogram. The blank sample produced a flat baseline that was only observed at a scale expansion of 1000 times (three decades of expansion) the cholestane sample. Figure 5 - Background check after running 5 consecutive strong samples. The results above demonstrate that the DEP technique does not suffer from "memory effect" or "cross contamination" problems.> The high temperature cleaning step removes all traces of any of the previous samples.> It is recommended that the high temperature cleaning step be used in all analysis.> Running a blank sample between samples is optional. Quantitation- Cholestane samples were prepared in chloroform in concentrations from 500 ng/ul down to 1.0 ng/ul as described above. The samples were analyzed with the AutoProbe as previously described.> The mass spectrometer was operated in the EI mode (70 eV), operated in the total ion scan mode and scanned from mass 100 to 400 daltons (2.9 scans/second).> Each of the prepared sample dilutions was analyzed five times to demonstrate that the automated DEP technique was quantitative and to show its reproducibility.> After each set of five samples a blank methanol sample was run. The results verified that the automated DEP technique is not only reproducible, but it is quantitative. Quantitation with a direct probe to our knowledge has not been achieved in the past. The reproducibility and quantitation demonstrated by the AutoProbe technique are due to the automation of the AutoProbe system with the exact same conditions being applied to each sample and to the unchanging geometry of the DEP filament. Since the filament coil is never touched or moved, the sample is injected onto the DEP filament coil in exactly the same position of the> DEP coil for every sample.> This provides for many new applications of the DEP technique to enable the fast quantitation of analytes. Slow Ramp Study A series of additional studies were conducted by heating the DEP filament with a programmed ramp from 0 to 900 mA at various ramp rates of 50, 100, and 250 mA per second to study the effect of a slower temperature ramps on the total ion chromatogram peak shape and sensitivity.> The resulting data was still linear, but the slower ramp rates produced lower total ion peak heights and therefore reduced the sensitivity of the technique.> Also due to the lower peaks heights, increased peak splitting and increased tailing, the reproducibility of the integration of the peak data deteriorated. The faster ballistic ramping produced total ion peaks less than one second in width. Therefore in order to get good quantitative data with at least 10 scans per peak, it may be necessary to scan the MS over a narrow mass range of less than 100 amu to achieve optimum quantitative results. The plots for both the total scan and SIM methods and for both the 299 and 358 ions are linear. The SIM does have the advantage of increased sensitivity as expected.> The limit of sensitivity for the total scan analysis of prednisone is about 2 nanograms, whereas the sensitivity for the SIM technique is less than 0.5 nanogram. The data was linear over the concentration range of 200 to 0.5 nanograms. The sensitivity of the SIM technique greater than the total ion scan method.> The SIM technique would have been detectable down to at least 0.1 nanograms had these lower concentrations of samples been prepared. The second alkaloid studied was diazepam. Diazepam dilutions from 500 to 0.4 nanograms were prepared in methanol.> Again, two MS methods were used for the analysis. In the total MS scan, the MS was scanned over the MS range of 171 to 311 daltons (6 scans/second), and in the SIM mode data was collected at masses 256 and 283 (15 points/second). The areas of the 256 and 283 ions were integrated and plotted as shown below (Figure 10). As in the previous studies the plots are linear, with the SIM plots being more sensitive. The sensitivity of the technique is about 0.1 nanogram for diazepam in the SIM mode. A number of samples have been studied via the AutoProbe DEP filament technique to determine the reproducibility of the AutoProbe system and to determine the accuracy of quantitative methods utilizing AutoProbe. Samples were analyzed from 250 nanograms down to 0.1 nanograms in both the MS total ion scan mode, as well as the MS SIM mode. The resulting plots of sample size versus total areas of an abundant ion in the MS chromatogram were linear over more than two decades of sensitivity. The results proved that the automated DEP technique is not only reproducible but also quantitative. In addition "memory effect" problems do not occur with this technique when the high temperature bakeout is used to clean the DEP filament wire after a sample analysis. Quantitation with a direct probe has not been reported in the past.> This reproducibility and quantitation capability of the AutoProbe technique is due to the automation of the system with the exact same conditions being applied to each sample and to the unchanging geometry of the DEP filament.> Since the filament coil is never touched or moved, the sample is injected onto the DEP filament coil in exactly the same point for every sample. This opens up many new applications of the DEP technique for the fast quantitation of analytes. The AutoProbe technique has been proven to be a quantitative MS injection technique that can reproducibly and quantitatively analyze higher molecular weight samples in about three minutes per sample.> The technique will be invaluable in the analysis of samples not only in a quality control laboratory but also in a laboratory where high volumes of samples need to be analyzed and quantitated in a short period of time.